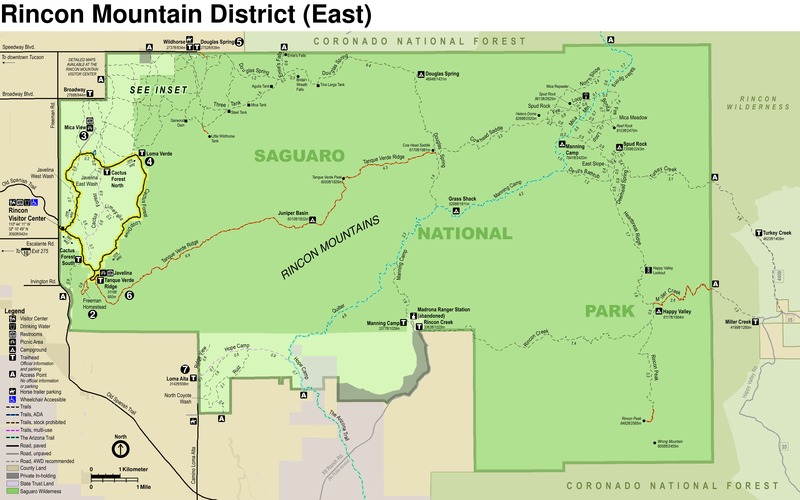 The Sendero Esperanza Trail is 3.2 miles long and is the major North-South Trail connecting the King Canyon Trail in the south to Golden Gate Road to the North. 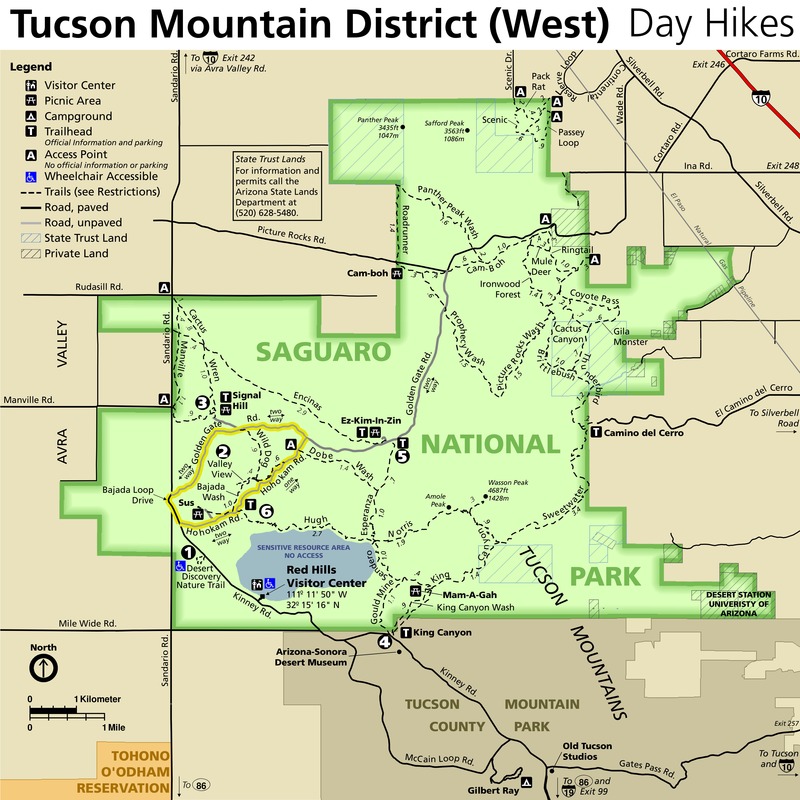 The trail crosses over a Saguaro National Park’s major East - West ridge with an elevation gain from Golden Gate road of 600 feet and from King Canyon side 450 feet. Sendero Esperanza crosses over the Hugh Norris Trail along the ridge and is the terminus of the Dobe Wash Trail and the Gould Mine Trail. Much of this trail is along old mining roads that are almost nonexistent now but evidence of the roads can still be seen. From Golden Gate Road this is a good choice for heading up to Wasson Peak. The Sendero Esperanza Trail head from the south is along the King Canyon Trail where it drops into the King Canyon Wash(about .9 miles from the King Canyon Trail head at Kinney Road). The Sendero Esperanza Trail heads west out of the wash and almost immediately comes to the Mam-A-Gah Picnic Area off to the left. Also immediately on the left is an abandon rock structure that was an outhouse built by the CCC in the 30’s and is now abandon. To me it looks more like one of those machine gun bunkers you would have seen in the Pacific during WWII. After passing the picnic area the trail continues to climb to a low saddle that crosses over to Gould Canyon (about 60 feet above King Canyon Wash). At .4 miles from the trail start is the Gould Mine. This mine was one of the more successful mines in the Tucson Mountains from about 1901 to 1911. The mine shaft is still there but has been covered by a steel grate and surrounded by a fence. There is also a rock structure that the trail passes by and I have been told this was a storage shed for explosives. The mine tailings have lots of color and make for great early morning pictures. 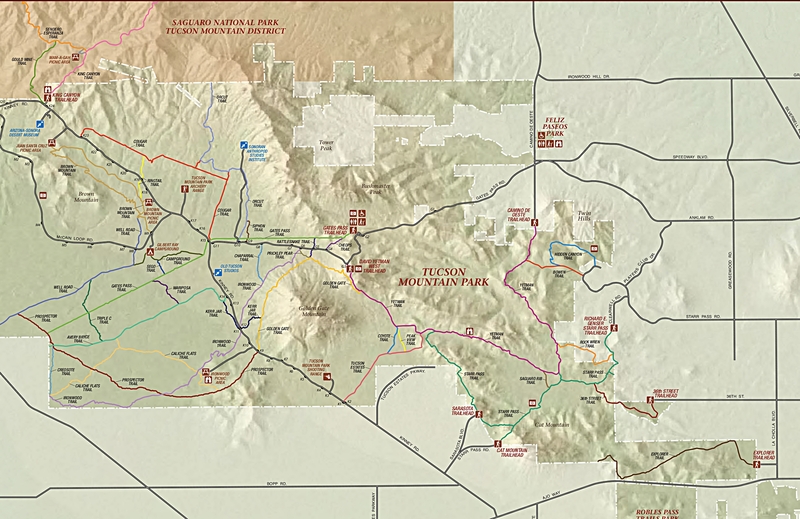 The Gould Mine Trail also intersects the Sendero Esperanza Trail near the Gould Mine and this trail heads down Gould Canyon and ends up at the King Canyon Trail Head. The Sendero Esperanza Trail heads west from the Gould mine along an old mining road with a few mining excavations along the way. The trail does a steady but gradual climb to the ridge about 450 feet in 1 mile. The last .3 miles of this trail to the ridge appear to be along an actual trail and not an old mining road. Once on the Ridge the trail crosses the Hugh Norris Trail which is the major East West trail in this section of the park. From the Ridge the trail heads north and drops 400 feet in the first .6 miles via a system of switchbacks. The switchbacks make this trail fairly easy whether heading up or down. At about .6 miles the trail once again follows along an old abandon road and at 1 mile from the ridge comes to the junction of the Dobe Wash Trail. From this junction it is .7 miles to Golden Gate Road. 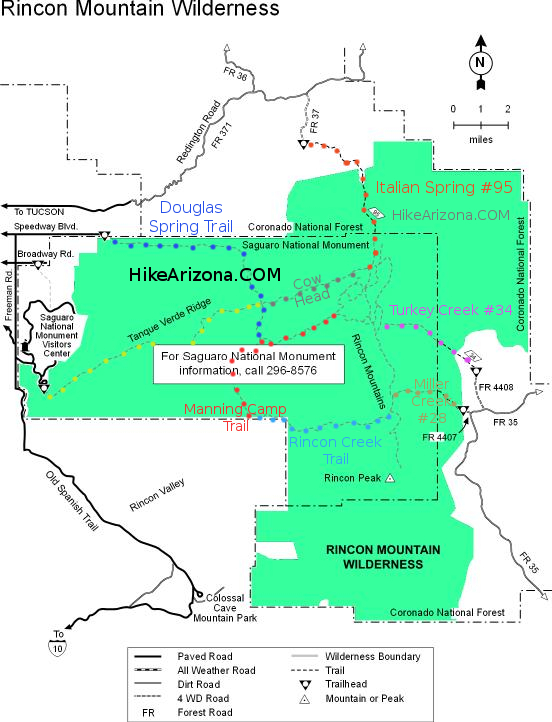 Since this trail starts and ends in two different sections of the park it is a good hike for a shuttle. The other option is use part of this trail to complete a longer loop hike using one of the connector trails. There are good views to the north and south from the ridge and is especially good in early morning and I assume at sunset. Be aware that the Golden Gate and Bajada Loop drive are closed at sunset and open at sunrise but the King Canyon entrance is open all the time. Trail Head from the King Canyon Side is at The King Canyon Trail Head along Kinney Road just north of the Desert Museum. 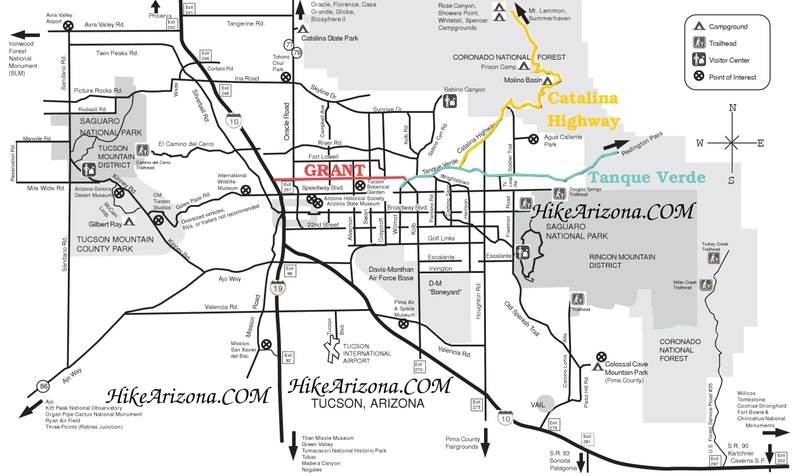 Trail head from the North side is along Golden Gate Road at the Ez-Kim-In-Zin picnic ground in Saguaro National Park West. The actual trail Head is about 100 yards north of the picnic area at a marked parking area. 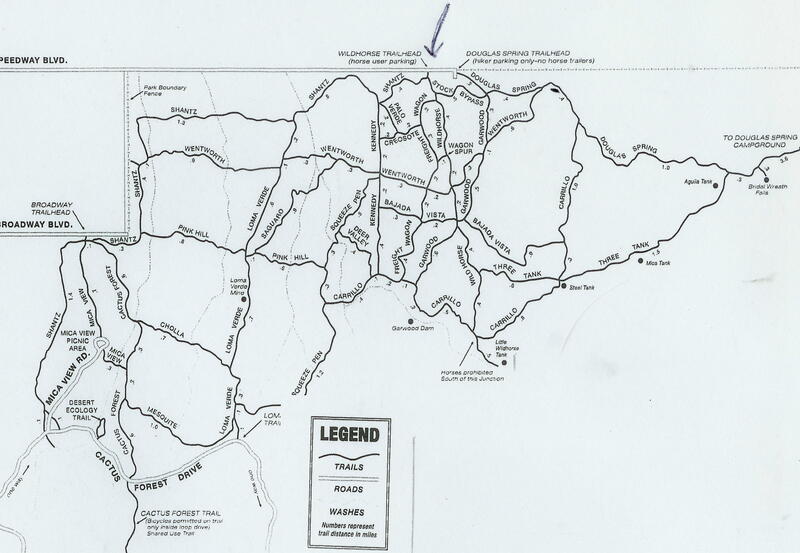 Golden Gate road is a dirt road accessible by a street vehicle from the west side along Sanderio Road. Golden Gate road from Picture rocks road to the trail head is accessible with a high clearance car.